Groups and coach parties welcome! Experience a fascinating visit with your group and coach parties to the accredited Cowper & Newton Museum. 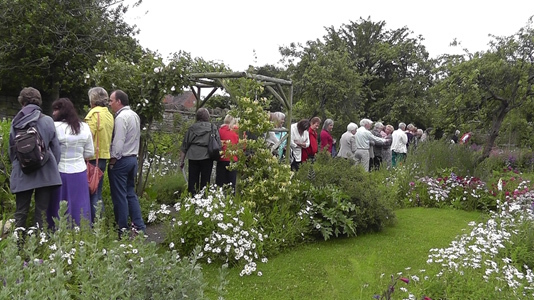 Group visits are very popular so please ensure you book in good time to avoid disappointment. An introductory talk on arrival in our courtyard. This gives you a brief history of the museum, William Cowper and John Newton. We are able to provide tea, coffee and biscuits by arrangement. Minimum group size 10. Discount on usual admission price. Complimentary free admission for coach driver. Download a booking form here. Prepayment for groups is requested. Please see our latest prices here. We are a Georgian town house consisting of 4 floors; these are broken up by flights of 6 steps and half landings. Each floor has plenty of chairs for visitors to sit on. The Shop, Courtyard, Gardens and Viper Barn are accessible by wheelchair. Our Viper Barn has interactive AV equipment for your enjoyment. 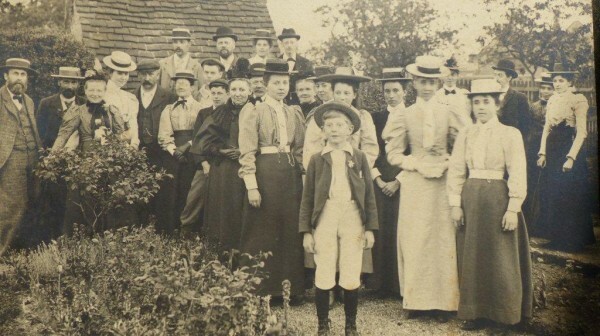 The earliest known photograph of a group visit by members of Wolverton Wesleyan Chapel to William Cowper’s Summer House, circa 1900. Photograph by Jonathan Knight, formerly of Olney.